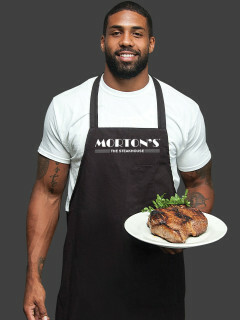 Morton’s The Steakhouse and Houston Texans running back Arian Foster have teamed up to host a Celebrity Servers Charity Dinner, with proceeds benefiting the Arian Foster Family Foundation. Houstonians can meet their favorite Texans players during a VIP cocktail reception allowing fans to take pictures, get autographs and mingle with their favorite professional sports team before they take on the kitchen. Guests will enjoy watching these all-star athletes serve an exceptional four-course meal paired with fine wines from Morton’s The Steakhouse. Throughout the evening, fans will also have the opportunity to bid in an exciting silent and live auction to benefit the Arian Foster Family Foundation, whose mission is to empower upcoming generations to strive for healthier and more hopeful futures.